Many years ago, as a child, I listened with growing interest to the pioneers of motor ‘bus services talk about life in days gone by. The services they provided enabled people to travel further than ever before and changed life in rural areas of the south west of England. It is not just a transport story, it is vivid social history. As time passed it was realised that the stories they told were dying with them and we determined to save as much as possible before it was too late. It was clear that the activities of the large operators such as the Westerm & Southern National Omnibus Companies, Devon General, Wilts & Dorset and Bristol Tramways were well recorded while the story of the many small independent firms, who provided many of the services in the westcountry, was in real danger of being lost. Thus we decided to concentrate our efforts on the latter. 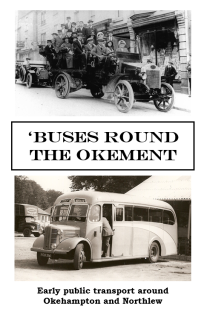 Over the years my wife and I have recorded the personal recollections of many of those who owned, drove and rode in horse drawn conveyances and the early motor ‘bus and charabanc services. In addition we have added extracts from official records, newspapers and numerous other sources as well as photographs and memorabilia. These now form an extensive archive covering the counties of Cornwall, Devon, Dorset, Somerset and Wiltshire during the period from the 1840’s to the 1960’s. Where the old-established operators continue after that date we continue to record their story. We welcome any contribution to the archive - memories, knowledge or memorabilia - and are always happy to try and help with any enquiries. Whether about a member of your family or anyone else, transport in a particular area or if you have any other interest please do get in touch by letter, telephone or e-mail. In order to share the knowledge gained during our research with those interested in transport, local and social history we have published a series of carefully researched books which tell the story of individual operators and set it in geographical and historical perspective. A list of these publications will be found on this site and we would be happy to add your name to our mailing list so we can keep you informed as new titles are published.